So there it is! I hope all of you can get a good sense of who I am and enjoyed hearing about myself. It is a such a pleasure to take part of this great opportunity and I am finding out so much about myself while finishing up this application process. I’m so excited to finish up the last couple parts of the process for you guys to see as well as the next blog posts that I have planned on writing. It’s going to be super dope! 1. I’m pretty sure I clapped 9+ times throughout the video. I guess I clap when I’m nervous. Haha. 2. I meant to say ‘Basque Country’ not the ‘Basque Region’. The nerves got to me and I was already on a good roll! 3. Wearing a tie is not mandatory at my job. I just started wearing them because all the guys who cook wear really neat hats but my head is way too big for a hat. So I chose to accessorize with some ties. My favorite tie has got to be the bacon tie (my Lady Gaga meat tie). Thanks Juan Carlos! 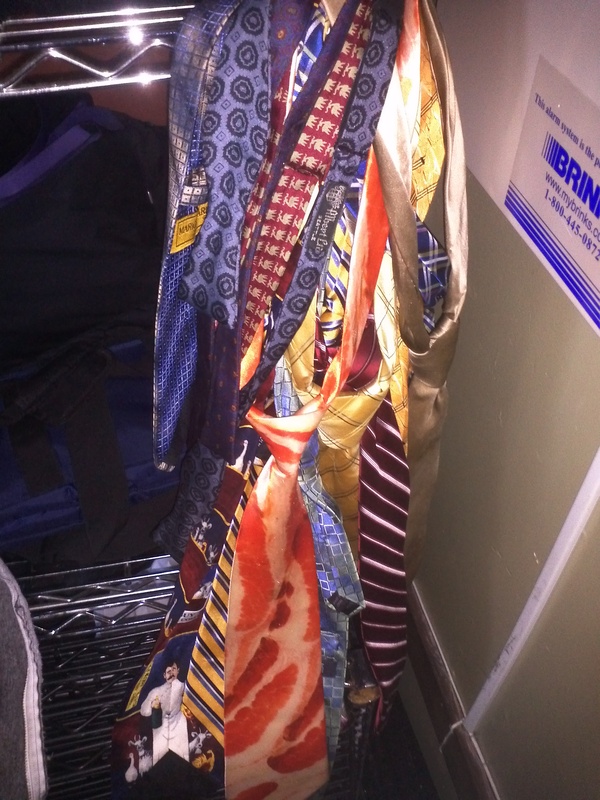 My tie collection at work! 4. I’m sorry to all of the other great people I work with that I didn’t get to put in the video. I didn’t realize how fast 2 minutes go by. But I really appreciate you all and you guys will be the reason I make it to Spain!